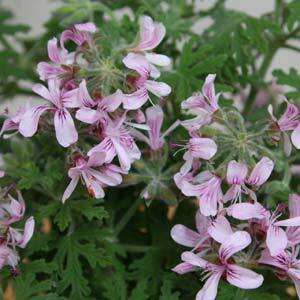 Sometimes simply called the Sweet scented or Rose Scented Geranium, Pelargonium graveolens, is widely grown for the flowers as well as the oils. The flowers are an attractive rosy pink, the oils are extracted from the foliage and used in making perfume. It is the foliage carries the scent and it is released when crusted or brushed against. The oil is also used in aromatherapy. This is a favorite geranium plant used in cottage gardens where it is grown near pathways as well as in pots and containers near doorways. Upright in growth habit, it branches freely to reach a height of over 1m. Flowers are pink to rosy mauve, 5 petals on a flower all margined with a deep crimson. Flowering time is from late winter through to summer, most prolific in spring, and sometime flowering through into autumn. Another species from South Africa, the oil is said to also have a calming effect as well as a lovely rosy fragrance. In the garden it will reach around 1m with a similar spread, however it is easily kept in shape by pinching back or pruning. Long flowering, from early spring to late summer. We grow a couple of plants in the garden border where they seem to take very little care. Best grown in full sun to a little afternoon shade in warmer climates. Once established this is an easy care plant. Before planting dig in some well rotted compost and manure, water in well with some seaweed fertiliser. Pelargonium graveolens can be grown in pots, containers or hanging baskets but keep the water up to them in warmer months. Watering is generally not required during the cooler months of the year except in very dry periods. Cuttings strike fairly easily. The best time to take cuttings is in late summer and tip cuttings are the easiest to propagate.